What to do with social marketing? Was the last post on your business Facebook page from 2013? Or maybe everyone is telling you that you “have to get on Instagram” even though you know you barely keep up with that Facebook page! You know you need to be part of the social media world, but you are so overwhelmed by it all that you just end up doing nothing and feeling guilty for not taking action. Social media can be a really powerful way to expand your marketing efforts, as long as it’s done with some thought and strategy. Here are some things to think about that might help you decide what do to next. The first thing you need to do is really understand why it’s important to have an active social media account. Social media expert, Laura Roeder, says that people aren’t hanging out on your website, they are hanging out on social media. Look, you still need a website. You need a place to drive people once they do find you on social media, but your customers aren’t sitting on their phones scrolling through your about page 40 times a day. They are on social media and if you are there too, you might be able to get them to follow you, gain value from what you are posting or eventually buy something from you. With so many platforms available, it’s really hard to know where to go. A lot of business owners get, what my friend likes to call, FOMO (Fear Of Missing Out) and they feel they need to be everywhere, but that could be a mistake. Here are a few things to think about before opening another account. Each social media platform has its own demographics. Think about who your target market is and research where they hang out on social media. For instance, don’t waste your time on Instagram if that’s not where your customers are spending their time. What do you want to accomplish on social media? Think about how you can provide value, gain trust and build your brand loyalty. It takes time. Learn the language and the nuances of each platform you want to be on. Learn how people engage on each, and learn how and when to post that valuable content and when to ask for a sale. Here’s a great article about creating your social media strategy along with an infographic that breaks a lot of this info down for you. Also, check out the book, “Jab, Jab, Jab, Right Hook: How to Tell Your Story in a Noisy Social World” by Gary Vaynerchuck to learn more about the language and how to plan a strategy for using each platform. Social Media Examiner is also a great resource. They post lots of tips and even have a free industry report you might want to download. Social media is a very visual place. Images, infographics, and photos get more likes, shares and comments than text alone. Have you thought about how you are going to generate your photos and graphics? What about the content? What kind of information do you want to post? A daily special? A valuable article that you wrote? Are you going to blog, make videos, do a podcast that you can share? Thinking about some of these ahead of time could mean the difference between posting once or twice and letting the account die, or being really active and engaging with your audience. We all start out with the best intentions on social media. We think we will be posting and engaging on a regular basis, but the daily demands of our businesses ALWAYS get in the way. Most of us don’t have a marketing department posting on social media for us all day long. We are BUSY! We are at meetings, appointments, answering phone calls, emails, text messages and the list goes on and on. Posting on Facebook, Tweeting or replying to a comment is the LAST thing on the list and social media accounts end up going dark. Not having the account at all is better than a customer or client seeing an abandoned page. 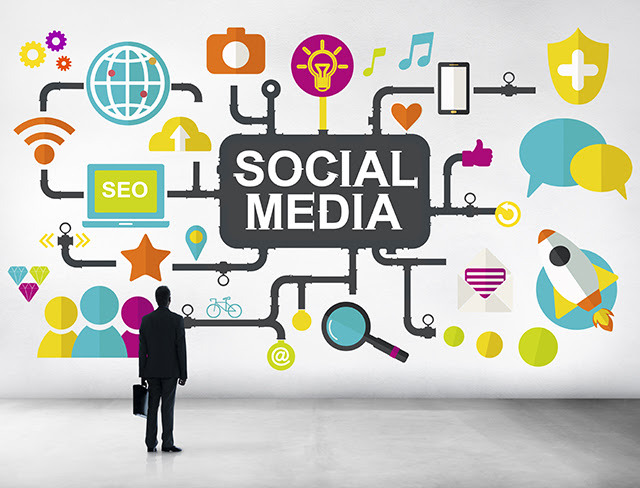 So think about what you can realistically manage when it comes to your social media strategy. — Dig into the some of the resources I linked to above. Make a plan. Start with one or two accounts and come up with a strategy that you can implement without too much effort in the beginning. — Be conscious of the time necessary to maintain it and see if it makes sense to build onto your efforts within that platform or to think about adding another more.Be realistic. Don’t expect people to be knocking down your door overnight. It takes time to build trust, engage with and grow your audience. — Be realistic. Don’t expect people to be knocking down your door overnight. It takes time to build trust, engage with and grow your audience. Don’t overwhelm yourself. Remember, you don’t need to be EVERYWHERE, you need to make the most of the platforms that make sense for YOUR business.